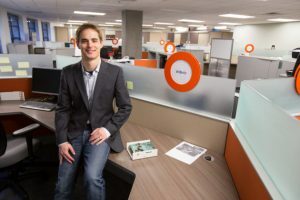 Alumnus Ben Waters is Co-Founder and CEO of WiBotic. While at UW EE, alumnus Ben Waters co-founded WiBotic, a company that enables drones and robots to charge wirelessly. Although it is only a little over a year old, the company has already reached significant milestones. To date, it has raised well over a half million dollars from a collection of funds and foundations. In their annual list – the “Seattle 10” – GeekWire announced which top Seattle startups were transforming the tech scene. In order to meet the prestigious list, a company had to exhibit a world-changing business idea. WiBotic’s innovative design and functionality makes it particularly unique and adaptive in today’s market. WiBotic wireless power solutions enable complete autonomy for any robotic system through their hardware platforms and power management software. The company’s charging efficiency is higher than standard inductive and other resonant systems, yet it also minimizes maintenance costs. The product also works in varying weather conditions and underwater. According to Waters, there is significant room for growth for this Seattle 10, which is already re-inventing wireless charging capabilities.